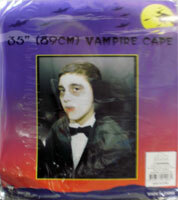 Ideal as table scatters, card decorations or as a spooky surprise in an envelope. 28.3g tube of UV glow in the dark body cream. Water washable. Recommended for 8+. 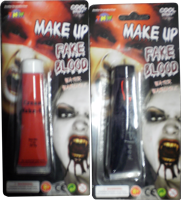 Choose from red cream make up 1oz or red fake blood 0.88 fl oz, or buy both! Plastic rod with 3 shades of sheer shimmer netting. Simply dip sponge into paint or brush paint onto sponge and press onto paper. Two to choose from - black spider or orange Jack-O-Lantern. 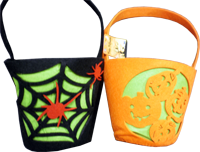 These felt baskets are 15 x 17cm. 89cm long. Available in black or red. Stick them everywhere this Halloween. Sheet size A4. Puffy shimmery stickers. Fits most adults. 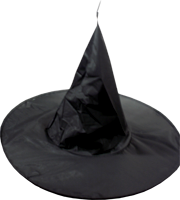 Top off your Halloween outfit with this 47cm tall witches hat. An essential for every little witch and wizard. 37cm tall.